Here we have a good range of low level podiums from 2.4m- 4.5m working heights. Always have the right platform height and never lose components. An extra 350mm additional height on our standard Podium step. If you’ve never used a Razordeck take a look at this Video. Huge platform.Very stable Podium and no components to lose. Why Use A Podium Step? 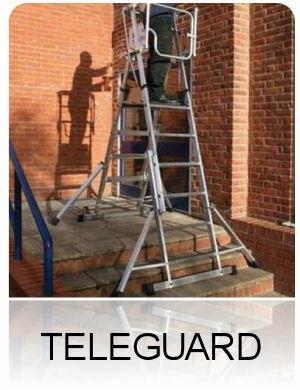 Far fewer sets of wobbly stepladders have been seen on site since the Working at Height Regulations (WAHR) drew our attention to the dangers of working at any height. In recent years more and more sub-contractors are hiring podium steps and turning away from ladders to stay ahead of the game. Podium steps are so much better than stepladders: they offer trouble-free and secure access to ceilings and walls, and reduce the odds of falling from just a metre. Tiny though they sound, falls from under a metre accounted for 69 deaths just before the WAHR were introduced in 2004 – that’s some food for thought, eh? 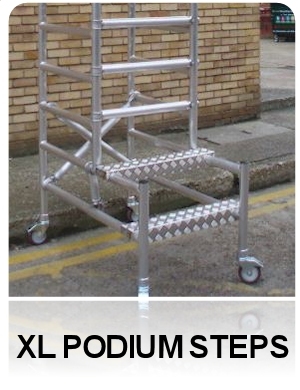 In the last couple of years, many site contractors expect subcontractors to hire podium steps and not turn up with stepladders. This makes sites safer and, of course, encourages a more professional approach to work. 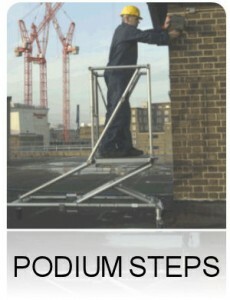 Podiums steps hire is easy and affordable. Give lakeside-hire a ring to discuss podium hire further. So what exactly are podium steps? One of the best podium steps you can hire resembles the stepladder and comes as a one-piece item, which folds so it’s easy to carry. They are the same height as a regular set of steps, but, to provide a solid base, they are wider. 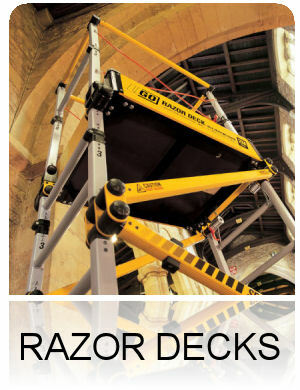 With lockable wheels on the base and narrow enough to fit through a standard door the podium steps enable you to easily access all of your work without having to shunt and carry tools and materials between areas of work, simply push the whole hired platform to the next section and carry on work. See Podium steps. Why? for more information.